Directed by Mike Shepherd, former Stan Kenton trumpet player and present band director at Brookings-Harbor High School, this ensemble includes some of Mike's high school jazz band players plus several community folks. A few have been professional players with big-name bands and/or regular performers in Las Vegas, including former long-time trombone soloist with Stan Kenton, Archie LeCoq. Yvonne and Norman received invitations to join the group in 2003 with Yvonne on third trombone and Norm on bass trombone. We continued to sit in with the group with Yvonne eventually moving to bass trombone and Norm going up to share first and second parts with Archie. The group disbanded in the spring of 2006 when several members had either moved out of the area or had scheduling conflicts. 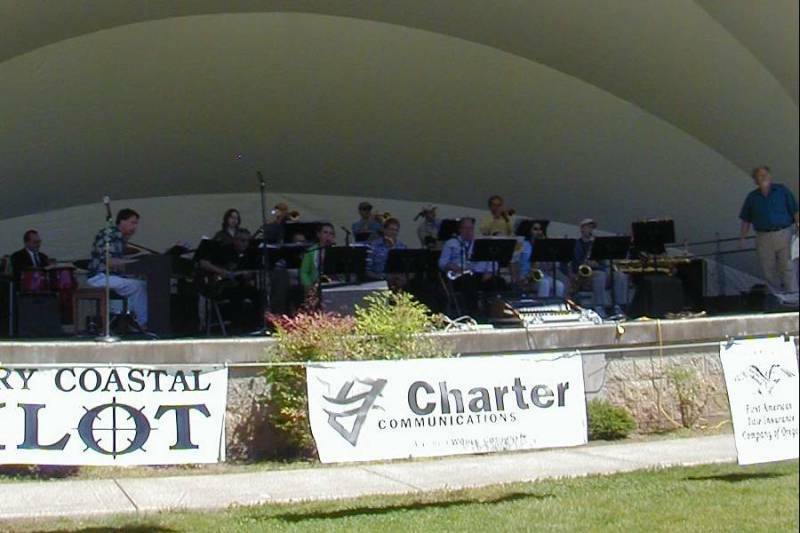 This photo was taken during the band's performance in Azalea Park in Brookings on June 12, 2005. We're hard to see, but Yvonne is at the right of the second row on bass trombone (with just the top of her head visible over the stand in front of the player of the silver sax) while Norman is next to the electric bass player (with just the top of his head visible over the stand behind the sax player wearing green) sharing lead and second parts with Archie LeCoq.